The other afternoon I made some effort (always necessary in these days of easy entertainment accessibility) to clear out my PVR. It's been nearly 20 years since I first saw 'The Brother From Another Planet'. And, you know... I'm so very, very glad I revisited it! Halfway between 1982's E.T. and 1986's ALF there came 1984's otherworldly visitor with a strange perspective and a noble heart. He didn't land on Harlem... Harlem landed on him. No... no, I was right the first time. Yup, crash-landed from space, pretty sure about that. Those three toes are a dead give-away. Mute and cast adrift, terrified but stoic, the Brother struggles to rise up from nothin'. He even lost his whole FOOT getting here! (It grew back.) He's got a surprising array of mental and physical powers revealed to the viewer as needed. And he uses each one for the betterment of his adopted community. This Ree-Toh would give a Kryptonian a run for his money. Or make him check his wallet. Oh, I kid! Seriously, though, The Brother needs money. 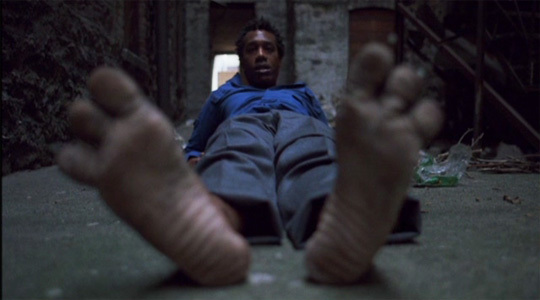 Joe Morton's astonishing silent performance in the lead role held me spellbound. I've enjoyed him as the repentant Dr. Miles Dyson in Terminator 2, and as the brilliant yet warm-hearted rocket scientist Dr. Henry Deacon in Eureka. Not to take anything away from those fine characters, but he's just amazing here. If you can bring yourself to stop chattering and just really LOOK at the guy... his whole soul is there in his eyes and face. Making a new life isn't easy for a space-brother, especially with pursuers literally baying for your blood to drag you back to your invisible but all-too-real chains. These menacing men in black are given the right amount of deeply unnatural gusto by Alphas' David Strathairn and writer/director John Sayles. Now I really need to locate and watch (or is it revisit? I honestly can't remember) another of Mr. Sayles' sci-fi productions: Battle Beyond the Stars. 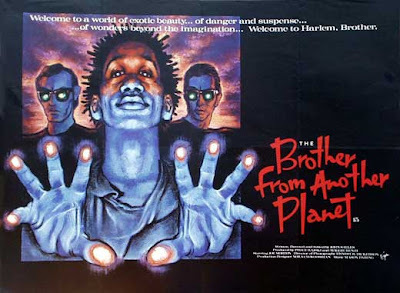 If you need your SF superhero story fix, or you're just trying to find an overlooked gem, brother, this is the film for you!